This week of the challenge has been all about research and wine cellar design ideas. How much do we want to spend on this project and what options do we want to include in our cellar? Welcome to week 2 of “the One Room Challenge”. If you are joining for the first time, welcome, I am so happy you dropped by. I am a guest participant in the challenge, designing and working on a wine cellar for our home. You can check out the before pictures of the cellar from Week 1 HERE. The One Room Challenge™ is a widely anticipated biannual event every April and October. Each round, twenty design bloggers take the challenge and transform a space. Every Wednesday, the designers document their process while sharing their sources and professional advice over six weekly posts. You will definitely want to check out the beautiful spaces they are designing, you will be wowed and inspired by their talent HERE. Beginning Our Wine Cellar Design Project – “What Type of Wine Cellar Do We Need”? There are several factors we need to consider in the design of a wine cellar, most critical are location and temperature control. It is important to ask these questions before you start building the cellar or space. Do we need to add climate control for cooling and humidity? Do we want to age wines for years or even decades? Will the location and condition of our cellar require us to have a cooling system? To answer these questions, we first need to determine the types of wine we plan to store. Will we store caseloads of inexpensive easy drinking wines or do we plan on buying vintage Bordeaux to store for when our kids get married. The answer to this question (for us) is simple, a lot more of the first and maybe a little of the second. We envision our cellar to be a place to hang out and do tastings. We will fill the room with mostly easy drinking wines and perhaps a few more expensive ones for special occasions. I also want the cellar temperature to be comfortable. I don’t want to have to put on a parka just to go inside. If we added a cooling system, that would be the case. In our situation, we already have the perfect space and room that was previously built for a future wine cellar. The room does not have any windows and is located in the coldest area of the home, the basement, making it an excellent location. The walls are covered in stone and no heating ducts are in the room. It is the perfect space to store wine without having to add a cooling system. After all this is how old European wine houses stored wine for centuries. The location of the cellar is an important deciding factor when considering a cooling system. Let’s say you decided on a location for your wine cellar or wine wall but direct sunlight shines on the area making it much warmer than the rest of the house. This type of heat and sun can ruin even short term wines. This type of space would require a cooling system even though you weren’t planning on putting one in. We narrowed our search of wine cellar companies we believe will fit our needs and budget. The price to build out a wine cellar varies greatly, a small closet with a few DIY racks could probably be done for around a $1,000, while a large temperature controlled space with insulation and custom racks could cost $50,000 plus. It all depends on the space and what needs to be done to the space to make it ready for a wine cellar. 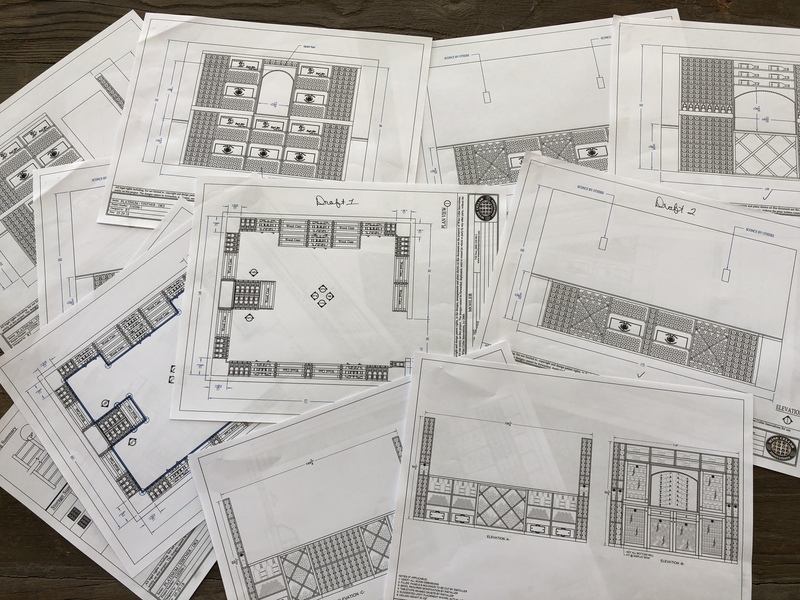 Having a rough idea of what we want to include in our cellar and our budget, we worked with each company on coming up with a design that fits our needs. This is a time consuming process, and it’s not uncommon to wait several weeks before having an initial design in hand. We provided exact measurements of our space along with other requirements and limitations in order to get a custom fit for the room. While we are working with the wine cellar companies on getting designs and quotes, we are doing prep work to the room. Remember the black ceiling with red lights? We painted the ceiling an off white, which seemed like a good idea at the time. But on second thought, I think the ceiling requires more work. I want to eliminate the 6 recessed lights in the ceiling, remove the 2 fan covers, and add a chandelier in the center. Seems easy enough, right?! The room also a wooden baseboard around the bottom, and instead of eliminating the boards, we plan to add rope lights behind it for accent. In addition, we will replace the present sconces with new ones. I believe a chandelier, 4 sconces, and base lighting will be sufficient to light the cellar and give us the right amount of ambiance. We also plan to add a seating area with a bar height table and stools. I can’t wait to see your progress! Hi Bettye! It’s coming along…we are assembling racks this week! Stay tuned! What a fun room to do for your ORC! Can’t wait to see the final reveal! It is a fun room!! I can’t wait to have it finished and have my first glass of bubbly 🙂 Thanks for visiting. How fun! I’d LOVE to have a wine cellar! Wow, I love the door already! The door is very cool! But I am getting ready to paint it!